a little bit country, a little bit chic. Out now for the April round of Collabor88! Second Spaces is happy to be part of a new event: The Clique! The event theme is the classic 80's movie The Breakfast Club, with each designer being assigned to a main character for their inspiration. I've got the Claire Vanity, available in 7 colors, complete with mirror and chair. Available exclusively at The Clique from now until April 4th! Out now for the March round of The Arcade: Get Fit (For the Summer). Time to get your healthy on, work those muscles, and embrace that fit lifestyle! 10 Commons, 1 Rare, 75L per play and available exclusively at The Arcade from now through March 31. 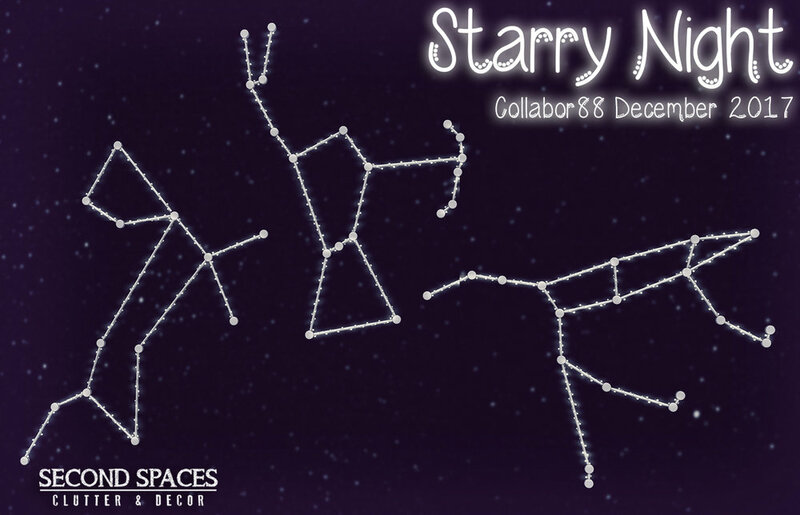 The February round of Collabor88 is open! This month's theme is Right As Rain and from Second Spaces, I have the Rainy Day Cart. It's available in four color sets, and each set includes a version with umbrellas and an empty version for your own stuff. The January round of The Epiphany is open! From Second Spaces is the Not Too Shabby Kitchen - perfect for little cottages and cabins and quirky abodes. There are 15 Commons, 1 Rare, and of course, 1 Exclusive item! 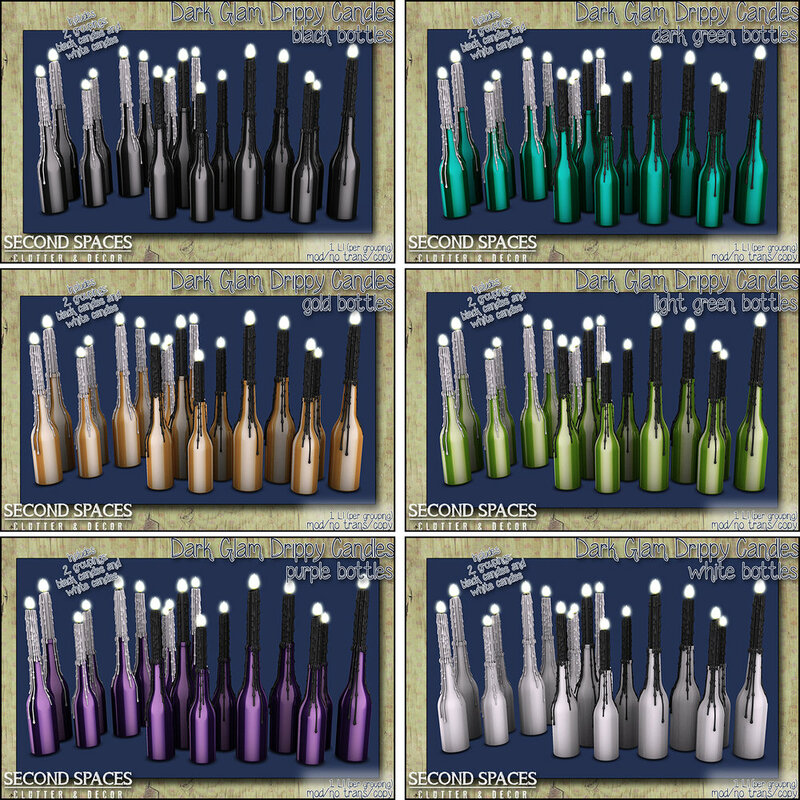 Collabor88 is open now for the January round, and I've got the Moody Dresser available in 6 colors, each just 88L for the event. How moody can you be with those prices?? Dark Glam Consoles and Drippy Candles are out now at Collabor88 for the November round! 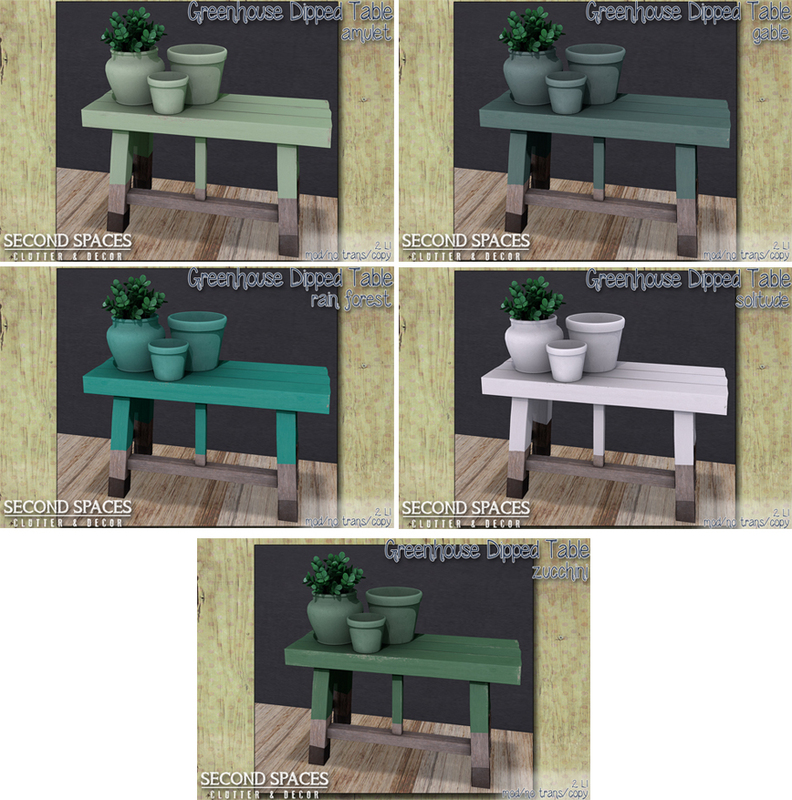 Out now for the October round of The Epiphany: the Modern Farmhouse gacha set! 75L per play, and full of all the decorative, random bits and pieces to fill in your empty spaces. The October round of Collabor88 is open! 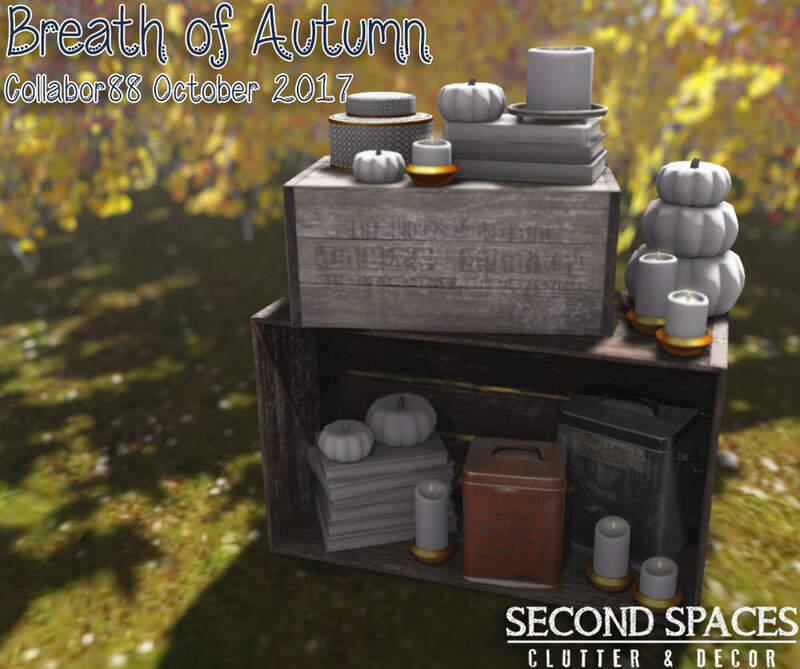 I've got the Breath of Autumn Vignette set -- a cozy, rustic stack of stuff, perfect for autumn-izing up your spaces and corners. The set includes all the things for instant, one-rez decorating! New for the September round of Collabor88 is the Blush Seating set and the Indoor Firepit! Both are available exclusively at C88 from now through Oct 6. Also available now is the Porch Door Cabinet, as part of this month's Deco(c)rate subscription box! If you've already subscribed to this month's Deco(c)rate box, then you've already gotten this! And if not, no worries -- you can still pick up the box at the Deco(c)rate HQ. Check the Deco(c)rate site for all the info! The September round of The Arcade is open! This month, I've got a Mudroom set with all the components you need to design the perfect room o' mud for your space. There are 16 items total -- 15 commons and 1 rare -- and the machine is 75L per play. So excited to be part of a new event: Thereafter, A Post Apocalyptic Affair! It's just opened today and it's all about...well, post-apocalyptic times, obvs. From Second Spaces, I've got two sets of Supply Shelves. We've got Outlook: Hopeful, for those early days when you think maybe everything will work out just fine...and then Outlook: Bleak, when reality hits, the infighting starts, and someone has eaten all your military-grade mashed potatoes. DARK DAYS, MY FRIENDS. 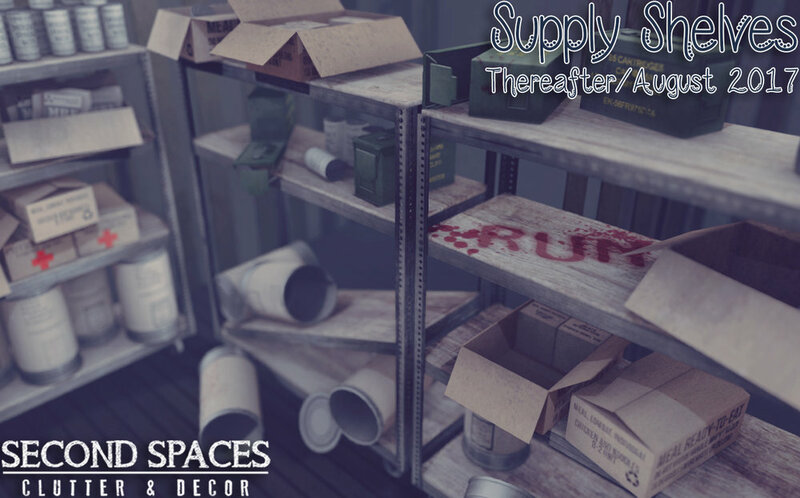 Each set includes 2 shelving units stocked with supplies...of course, the Bleak set is a little less stocked. You understand. Both sets are available exclusively at Thereafter from now through August 27. Hiya! Super happy to be a guest designer for this month's birthday round of Uber! I've collaborated again with Isla Gealach of Cheeky Pea, and together we've brought you Retha's Nook. Comfy, casual, and full of little decorative touches, you can get the whole set or the individual pieces exclusively at Uber! The June round of Collabor88 is open! Second Spaces has the Retro Resort Loungers, available exclusively at C88 through July 6. There are three color packs to choose from, and each pack includes 2 chairs - one fully reclined and one sitting up (for people watching). Both chairs are complete with lots of fun and summery singles anims!